The Tour du Valat can be visited several times a year even if, unlike many organisations in the Camargue, our main vocation is not to receive the general public. 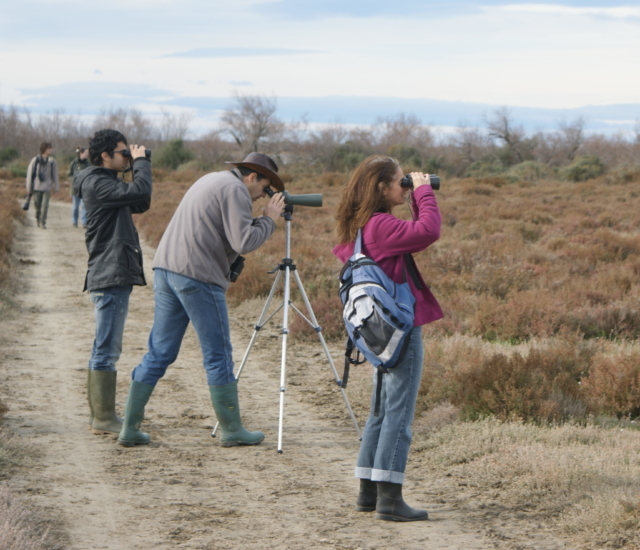 We are a research institute for the conservation of Mediterranean wetlands and owners of a 2921-hectare estate, much of which is listed as a restricted-access Regional Nature Reserve (the area is above all dedicated to the work of scientists and natural area managers, and to protecting the flora and fauna of the Camargue). In partnership with the Nature Guides Office (BGN) guided visits to the heart of the Tour du Valat Regional Nature Reserve are organised from November to April, every second Saturday of the month). Visits must be booked in advance and you will be charged a fee. They are managed directly by the BGN: www.guide-nature.fr (in French) or +33 (0)6 95 90 70 48. The Friends of the Tour du Valat association also organises several thematic guided visits to the Tour du Valat Estate every year, reserved for its members. The Étang du Grenouillet observation platform on the Fiélouse road from Le Sambuc linking the D36 to the Etang de Vaccarès, just north of the Tour du Valat. Our general-public events are announced in advance on our website and social networks, and though the local media. Would you like to be e-mailed the schedule of the general-public events organised by the Tour du Valat? You can also keep in touch with the Tour du Valat’s events subscribing to the newsletter on the homepage. Activities for teachers and schoolchildren? Finally, the Arles and Saintes-Maries-de-la-Mer tourist offices are also very good sources of information about possible activities in the Camargue. How to get to the Tour du Valat? The Tour du Valat is located in the Camargue, in the Bouches-du-Rhone department, about 30 km south of Arles. From Nîmes, Avignon, Aix-en-Provence, or Marseille via Arles: from Arles head towards Les Saintes Maries de la Mer then turn left toward Salin de Giraud on D36. Go through the village Le Sambuc. After about 800 m, take the first turn on the right (C136, Fiélouse du Sambuc). After three kms, just after the bridge over the canal (S-bend), continue straight on, up the Tour du Valat driveway. NB, there are no service stations on this route. From Marseille by the Bac de Barcarin ferry: head towards Martigues on the A55, then Port-Saint-Louis-du-Rhone, Salin de Giraud. Before reaching Port-Saint-Louis, take the D35 (on the right after the bridge) towards the Bac de Barcarin ferry (fare). After crossing the Rhone, go right towards Arles (D36) and continue for about 12 km. Before arriving in the village of Le Sambuc, turn left onto C136, Fiélouse du Sambuc. After three kms, just after the bridge over the canal (S-bend), continue straight on, up the Tour du Valat driveway. The nearest station is Arles, which can be reached by all the major train lines, or the Mediterranean TGV high-speed line, via Avignon, Marseille or Nîmes. From Arles railway station the ENVIA network’s n°10 bus line runs from Arles to Le Sambuc several times a day (see bus times). The closest airport is Marseille-Marignane (65 km). There is a shuttle bus (every 30 min) linking Marseille-Marignane airport to Vitrolles SNCF railway station, from which there are trains to Arles.